French FM Fabius said some ministers will leave today but will return to Vienna on Sunday to "finalize the final deal." This is the most upbeat assessment of the talks. Reports from Tehran after Amano meetings indicate that Iran will accept managed access to individual nuclear scientists as well as military sites under the Additional Protocol. This will resolve the contentious issue of PMD, and a major step in sealing a final deal. 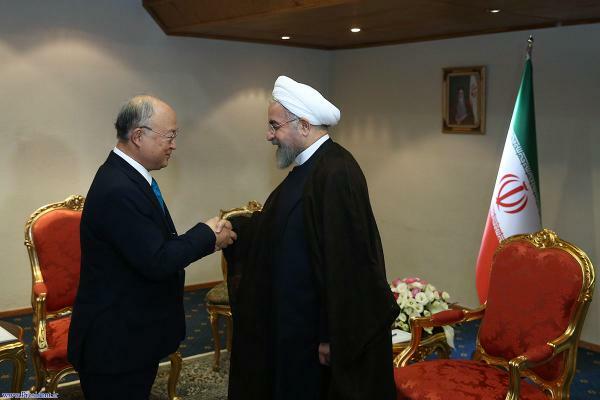 IAEA Chief Amano meets President Rouhani in Tehran. PMD and Parchin inspection expected to be the topics of discussion. Chinese FM Wang Li has arrived in Vienna, telling reporters there is “high possibility” of reaching a deal by 7 July. “Hope we’ll have consensus,” he said. EU’s Federica Mogherini said, “We are moving forward, but we are not yet there. Amano’s trip to Tehran is very important.” She added that some political issues are still open the ministers will be checking today. Iranian reporters quoted Admiral Shamkhani as saying, “We are ready to solve all remaining issues with close cooperation with IAEA.” He made those comments during a meeting with Amano in Tehran. British Foreign Secretary Philip Hammond said despite signs of narrowing differences, no breakthroughs yet. Sources: Twitter accounts of Al-Monitor's @lrozen and other reporters covering Iran Talks Vienna.